HIMPACT leverages today’s technology to create a more productive toolset for people charged with managing inventory. The design is new from the ground up, a “greenfield” project, not limited by the constraints imposed by older legacy architecture. Our innovative solution makes your business more profitable by improving customer service, lowering inventory, and increasing buyer productivity. Our clean sheet approach and the principle of “Purchasing working for People” have driven the development of a feature rich set of tools. Utilizing new forecasting methods and analytic tools, customers are achieving significantly better results, whether coming from a current ERP solution, a 1990’s best of breed legacy solution or an earlier Herlitz design. We are confident that HIMPACT will improve your business performance. 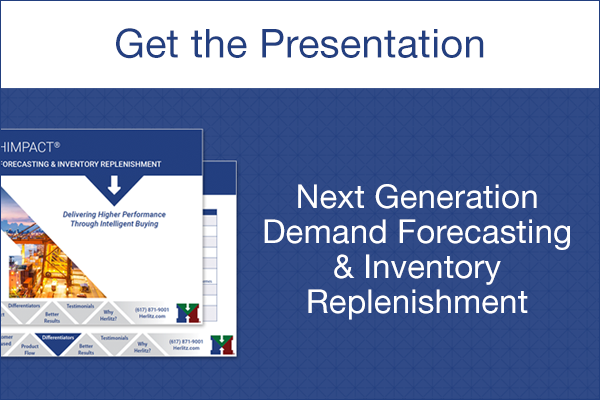 Advanced Demand Forecasting translates to Higher Sales New proprietary forecasting techniques improve the tracking of market shifts on new, promotion, and trending products. Actual Order Entry Demand is used in our Service and Lost Sales Analysis. SALSA’s new approach greatly improves forecast accuracy at the DC level. These provide customers dramatic improvements in service and increased sales. Lower Inventory with less Safety Stock HIMPACT’s new forecasting methods and a much improved Safety Stock calculation lowers safety stock by 30 to 50 percent. The estimations and approximations required by legacy systems from the 1990’s are gone. HIMPACT calculates a much tighter forecast and more exact Safety Stock. Faster Trend Spotting with Daily Re-forecasting New techniques drive better results. Instead of weekly or monthly time periods we use new, proprietary forecasting methods to bring you closer to demand; providing higher service at lower cost. Daily and Automated Forecast Exceptions Daily exceptions are delivered as part of the enhanced buyer TODAY page. Making adjustments today, before you place any orders, immediately improving the quality of buying decisions. For dips and spikes in demand, HIMPACT provides a suggested solution for user approval or modification, instead of just flagging the problem. Filter Promo Demand down to Chain and Store Revolutionary demand filtering, let’s you drill down and identify by chain and region and store what was sold on promotion. Buyers gain a better understand of customer promotions and greater visibility to true demand. Seasonality within the Week Daily Variation in demand within the week is automatically tracked for each product and location. The “seasonality within the week” is integrated into replenishment ordering. Delivering a better flow of product, particularly for short shelf life products. Use “Big Data” to Drill down for Better Insights View Customer/Store order history segmented to match up to your key customers, channels, or segments. Identify the “root cause” of demand changes, whether new behavior or changing customer preferences. Improve the quality of forecasts, buying decisions, and customer service. All functionality available for Store, DC, and VMI All key functionality for store replenishment, DC replenishment, and VMI is available at all locations in your network. Example: If you want to forward buy direct store delivery (DSD) vendors , we support that. New Technology base: MS -SQL AS/400 personnel are harder and harder to find and expensive, finding MS-SQL support is both easy and affordable. No DBAs required! You can find programmers right out of college or send someone to a few classes and you’ll have the in-house support you’ll need for our solution. New User Interface, access Everywhere The User Interface is clean, logical, and intuitive. providing users easy access to all information, increasing productivity. Herlitz legacy users learn HIMPACT in less than one day. Web based, you can access the system from anywhere with your laptop or tablet. Rapid Implementation Use your current ERP or legacy interfaces and be up and running in days. Complete an inexpensive and quick technical implementation in weeks not months. Robust and Easy to use Forward Buy Modeling HIMPACT has enhanced forward / investment buying that handles multiple deal terms. A new simulation tool supports “on the fly” testing of proposed deal scenarios. Review the benefits and then develop your own alternatives for negotiations with suppliers. Spread your forward buys out over a broader planning horizon. Simulate your Future Promotions Future promotion projections can inputted, run and saved. Simulate a Planned Buy using Date ranges, Item Mixes and Uplift Factors. Once you are happy with the results you can save it for execution at a later date. KPI Scorecards are Integrated The key performance indicators are integrated into the solution. The system is tracking all key metrics, on a daily or weekly basis. Improved Due Order Logic New Due Order replenishment logic supports more items per vendor. No need to split large vendors into sub-vendors by grouping Fast & Slow moving items. Simulate Forecast Changes and Compare Simulate forecast adjustments, then review and compare the results with the current values before updating. Repeat your adjustments until you get the right results, then update the forecast information. More Precise Order Building Precision orders are built to more exact specifications to either the min or max, using multiple constraints, linked via an “and” or an “or” relationship. This minimizes investment and ensures the lowest landed costs. Enhanced Truck Split Improved truck split supports three constraints concurrently, for example, Cube and LBS and $USD, selected from the 9 Units of Measure we support at the Truck, Vendor and Item Levels. Input the multiple constraints of your truck fleet and build loads to those specifications, greatly improving the coordination of replenishment with inbound logistics planning. Improved New SKU Roll-out and Pattern After New improved tools simplify the new item and supersession processes. Start and Stop Dates on Vendors, Locations, Notes & Forecasts Automating the inclusion and exclusion of key information on a time phased basis, increasing productivity. Enhanced PO and Reporting Delivery Output is delivered in your preferred format; Excel, PDF, e-mail and more. Increased Note Capabilities Key documents are attached and available when question arise. Better Drill Downs Up to 5 levels of groupings for System Defined and User Defined Custom Groups, for a total of 10; supporting today’s BI tools granular levels of analysis. We’ve also increased ranking capabilities so you can increase your focus. HIMPACT leverages today’s technology base and its innovative design, to increase insights and streamline your team’s processes to create higher value and performance. You will see improvements in sales and service over your current solution, whether you are using SAP, Microsoft Dynamics, Oracle, JDA AWR or ASR. We are highly confident that HIMPACT will enhance the performance of your business. If you have any questions or would like additional information, contact us.